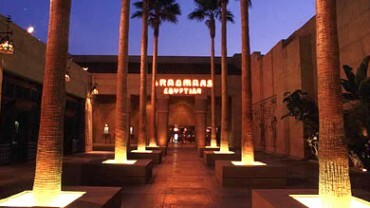 Grauman’s Egyptian Theatre is a noted movie theater located at 6706 Hollywood Boulevard in Hollywood, California. Opened in 1922, it is an early example of a lavish movie palace and is noted as having been the site of the first-ever Hollywood film premiere. Since 1998 it has been operated by the American Cinematheque film archive. Parking: There are several area parking lots that charge various amounts at various times of day. The Egyptian does not validate for the Hollywood & Highland complex parking lot or any other lot. The address of the Egyptian Theatre is 6712 Hollywood Boulevard, between Las Palmas and McCadden, just east of Highland Avenue in Hollywood. Selma Avenue is just south of the theatre. The Egyptian is a very short walk east from the Hollywood & Highland Metro Station!